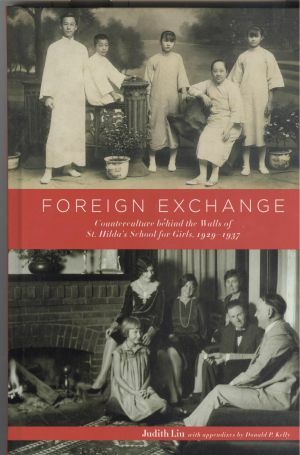 Foreign Exchange: Counterculture behind the Walls of St. Hilda’s School for Girls, 1929-1937 is the story of Yeh Yuanshuang and Dorothea Kingsley Wakeman and their experiences at the American missionary school in China. Founded in 1875, the school that would become St. Hilda’s School for Girls was intended to provide a strong Christian education for its students. Daily student-teacher interactions, however, created an environment that allowed for a foreign exchange that led to the creation of a new culture that subverted both American and Chinese gender constructs. The walls that surrounded the St. Hilda’s compound served not only to protect the school from outside danger but also to create a space where new gender expectations could be nurtured away from the gaze of prying eyes. Thus, the American teachers as well as the Chinese students were acculturated and socialized in ways that liberated them from their respective patriarchal situations. For Dorothea, serving as a teacher allowed her to remain single yet still be engaged in a professional career that would not be as socially stigmatizing as it would be if she remained at home. As a teacher at St. Hilda's, not only was she educating a future generation of Chinese women, but as an independent woman who served in an important position, she was an example for the girls at St. Hilda's of what women could do when given an education. For Yuanshuang, her education provided her with a means to aspire beyond the traditionally prescribed roles of daughter, wife, and mother by giving her the intellectual tools that enabled her to find work as a teacher at the start of the War of Resistance against the Japanese. Her involvement in school activities developed self-reliance, independence, and leadership skills that served her both in China and eventually in the United States.Yuanshuang and Dorothea's stories also reveal the impace of the modern world on their parents' generation. Dramatic changes in both the United States and China provided cracks in the patriarchal walls of their respective countries, and the book discusses the responses by their families to change. Judith Liu weaves together interviews of Yuanshuang and Dorothea as well as interviews of other St. Hilda’s teachers and students, never-before-published letters Dorothea wrote to her parents, and extensive archival research to create a fascinating tale of their experiences as well as the history of St. Hilda’s.